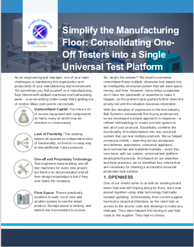 As an engineering test manager, one of your main challenges is maintaining the organization and productivity of your product or board testers. Yet sometimes we find ourselves amidst a manufacturing floor littered with oddball machines and half-working parts – a never-ending clutter creep that’s getting out of control. So, what's the solution?